Home / Related Equine Articles / Who Balances Whom? It seems like a simple question at first. Does the rider balance the horse or does the horse balance the rider? On second thought, however, what seemed obvious begins to get a little less clear. First of all, the answer has a lot to do with what we think is happening between the horse and rider and what actually is happening. But before we get to that let’s start at the beginning. What keeps you on the horse in the first place? Newton’s discovery goes a long way to answering this question. Gravity is the force Newton observed by watching apples fall from the trees. (I wonder if there were any horses around to help with the clean-up operation?) Gravity is acting down on you and your horse at all times. It is gravity that keeps you sitting on your horse whether he is standing or moving, otherwise you might simply float away. As long as you are straight and in the middle, so that the force of gravity is going in a straight line through you toward the ground, very little muscle effort is required to keep you where you belong. However, should you become a little off-center, no longer lined up straight, you have quite another story. So what happens when things aren’t lined up? Remember watching all those National Geographic TV shows where the African woman carried the huge basket on her head? Imagine what would happen if that basket was not in the middle of her head. Either the basket would wind up on the ground or she would have to maneuver to stay underneath the basket. How does that relate to riding? Think of yourself as the basket and the horse as the African woman. If you were to lean off to one side, either you would fall to the ground (if you didn’t do anything about it) or the horse would have to maneuver itself to keep you on its back. Don’t be surprised, lots of horses do this all the time (especially with handicapped riders); horses really don’t like us to come crashing to the ground. As humans instead of baskets, we have another option. If we are leaning we can use our muscles to keep from falling off. However, there are major side-effects from this solution that affect both ourselves and our horse. So at first, it seems obvious that the horse balances the rider since we are the one sitting on top and the horse has the job of carrying us. Now let’s look at another situation. Think about the last time you sat on a young horse who was only just under saddle. It wibbled and wobbled all around barely able to hold a straight line. Or perhaps you do dressage and have a wonderful up-and-coming horse who tends occasionally to lose its balance and fall on the forehand. In these cases the answer to “Who balances Whom?” is quite different. The rider, through the influence of their seat and leg, helps the horse establish its balance so that it can carry the added weight of the rider without falling or crashing about. With the dressage horse, the rider not only helps the horse to maintain its balance, he teaches the horse how to change its balance. Through dressage training, the horse learns to shift its center of gravity up and back towards the hind quarters, which lightens the front end and allows the horse to perform spectacular movements such as canter pirouettes. From this point of view it would seem that it is the rider who balances the horse. In fact, both of these situations are occurring all the time; the horse balances the rider and the rider balances the horse. Depending upon the ability of each, the amount the rider or horse contributes to the overall balance constantly changes. A well-trained horse is ideal horse for the beginner because it will develop all the correct feelings of balance within the student right from the start. 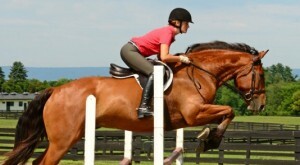 A top rider is the best for a young horse for all the same reasons. 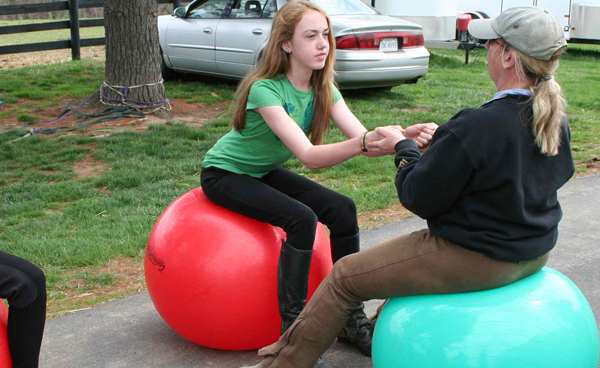 The experienced rider can maintain their own balance as the horse learns how to carry itself. The ideal situation (one of the ultimate goals in dressage) between a horse and rider is that each is able to maintain their own “self-carriage” at all times. We often think of horses in “self-carriage” – independently maintaining balance without the influence of the rider. It is not something we often refer to in the rider; however in order for the horse to achieve self-carriage, the rider must be able to support himself without having to hang onto the horse’s mouth with the reins or clamp on with their legs. So what happens to horses and riders that fall between these two extremes? We must go back to what happens when gravity is acting on a rider that is not sitting straight on the horse’s back. When gravity acts on a body that is off-center, the action of the force will be more in one place than the other (see figures 1 and 2). In order for the rider to stay on, large voluntary muscles must be used. The contraction of these muscles for the purpose of staying on causes stiffness in the rider. The stiffness then causes the rider to lose his balance even more, because he will not be able to fluidly follow the movement causing the horse to stiffen in the corresponding parts of its body. Overall it will become harder for the rider to stay in balance and harder for the horse to move. The goal then is for the rider to find pure balance in the saddle without having to grip or tighten, at all gaits, so that the horse no longer has to adjust itself like the African woman carrying the unbalanced basket. 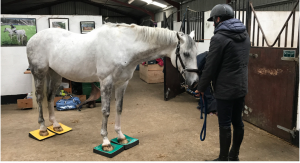 How can riders determine if they are partly the cause of their horse’s stiffness and training difficulties? Look at photos of you riding your horse or better yet have someone video you. Take pictures of you moving on a straight line from the front and rear as well as side-on. Ask yourself: “am I collapsing through the rib cage, am I leaning too far forward, is my back hollow and stiff or have I rounded my shoulders”? Look at photos of really top riders such as Reiner Klimke and notice that, if you were to draw a line down through the middle of him or across his shoulders, the lines are straight and square. Next time you ride, imagine that you are sitting as straight as they do and see what happens. Another test is to see if you can walk, trot and canter without using your reins for balance. If not, then begin to explore where you tighten in your body at the walk. Allow yourself some time for self-exploration. Ask yourself: ” are my hip joints “greasy” and free, can my seat bones follow the movement of the horse’s back at the walk, if I let go of the reins are my shoulders hanging freely and swinging with the movement , or do they feel tight? Then notice what happens to your horse as you begin to become more aware of the movement in your body. Ask yourself if your horse is tight in the same places you are and notice what happens as you relax and loosen-up. Once you find pure balance in the saddle, all the effort that went into keeping you on the horse can now go into improving your performance rather than just keeping you on board. Your ability to move and follow will make everything easier and more enjoyable. 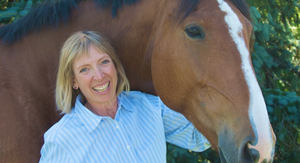 Most importantly, you will make your horses’ job of carrying you a lot easier and he will thank you for it by becoming a more willing, cooperative partner with whom to dance. Copyright© 1995. All rights reserved.